Weight-Loss Surgery Can Reverse Diabetes, But Cure Is Elusive : Shots - Health News People with diabetes who had gastric bypass surgery had much better control of blood sugar three years later. But most still hadn't met the goal of returning to normal sugar levels, a study finds. About 23 million adults have Type 2 diabetes, and most of them are overweight or obese. Bariatric surgery can help obese people lose weight, and excess weight is a big risk factor for Type 2 diabetes. 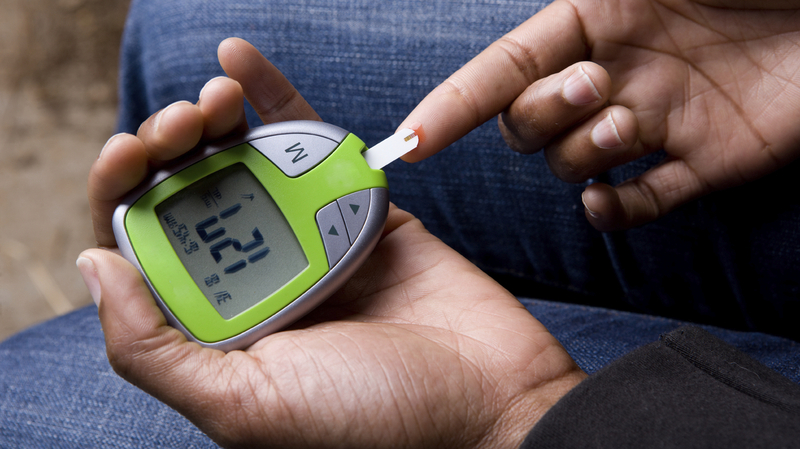 So it makes sense to try to figure out whether the surgery could help control diabetes, too. So far the answer is yes, at least for some people and for three years. But surgery doesn't work for everyone, and the long-term implications remain unclear. It's one of the first randomized controlled trials to look at bariatric surgery as a treatment for Type 2 diabetes, which affects 23 million adults. Still, almost three-quarters of the people who had surgery didn't meet the study's target of normal blood sugar, or 6 percent on an A1C test. And some of the people who had surgery still needed to use glucose-lowering drugs, including insulin. "Even though they did not achieve that target, they did get a lot better," says Dr. Philip Schauer, director of the Bariatric and Metabolic Institute at the Cleveland Clinic, who led the study. The people who had surgery lowered their blood glucose levels 2.5 percentage points, on average, compared with 0.6 points for the people who didn't get surgery. The people who lost the most weight and those who had been diagnosed with diabetes no more than three years before surgery did best, Schauer tells Shots. "If you want to achieve a long-term remission, intervene sooner rather than later," he says. The results were presented at a meeting of cardiologists in Washington, D.C., and published online Monday by the New England Journal of Medicine. Though the study is focused on bariatric surgery, it also shows just how hard it is to manage diabetes with drugs alone. The 50 people in the medication-only group were working with endocrinologists at the Cleveland Clinic and almost certainly getting more medical attention than most people with diabetes. Still, after losing weight and getting their blood glucose levels as low as 7.5 percent, by Year 3 their average level was up to 8.4 percent. "These folks were already on three drugs at the start of the trial, and many of them had more medications added to the daily regimen," Schauer says. "These a limit to how many medications a person can take in a day." This trial will continue for two more years. Even though that's long for a clinical trial, it's not nearly long enough to figure out how the surgery and the changes in blood glucose will affect people's health over the long haul.